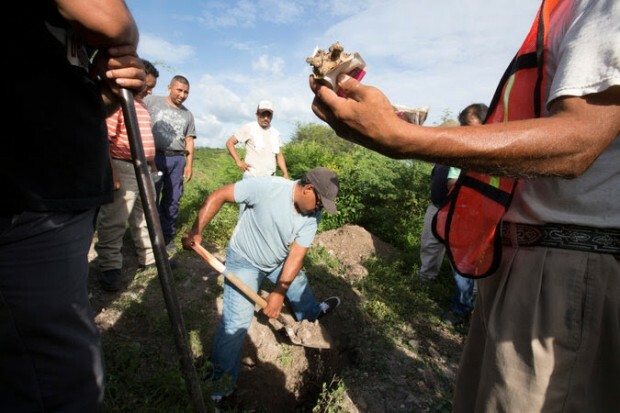 IGUALA, Mexico — With borrowed shovels and pick axes, the farmers drove their battered pickup trucks to a series of suspicious clearings in the countryside, jumped out and started digging. “Hey, hey, it’s a spine,” one of the men, part of a citizen police patrol, called out last week, fishing out what appeared to be a piece of spinal column. Soon came other fragments — a rib? a knee bone? Five mass graves have already been discovered in the hunt for 43 students who disappeared last month after clashing with the local police — and another half dozen secret burial sites like this one are being tested to determine the origins of the remains inside. Even with hundreds of soldiers, federal officers, state personnel and local residents on the trail, the search has still not confirmed what happened to the missing students. Instead, it has turned up something just as chilling: a multitude of clandestine graves with unknown occupants right on the outskirts of town, barely concealing the extensive toll organized crime has taken on this nation. The students were reported missing after the local police, now accused of working with a local drug gang, shot to death six people on Sept. 26. Prosecutors say they believe that officers abducted a large number of the students and then turned them over to the gang. The students have not been seen since. President Enrique Peña Nieto has declared the search for the missing students his administration’s top priority. But if anything, the hunt is confirming that the crisis of organized crime in Mexico, where tens of thousands are already known to have been killed in the drug war in recent years, may be worse than the authorities have acknowledged. The federal government has celebrated official statistics suggesting a decline in homicides in recent months. But the proliferation of graves here in the restive state of Guerrero — including at least 28 charred human bodies that turned out not to be the missing students — has cast new doubt over the government’s tally, potentially pointing to a large number of uncounted dead. Relatives of the students, who were training to be teachers and planning a protest against cuts to their college, agonize over the discovery of each mass grave. Some have given up searching on their own, convinced that a mafia of criminals and politicians knows where they are but are not saying. Many still believe the lost students are alive, joining the distressed fraternity of relatives of the thousands still missing from the drug war in Mexico. Such cases are rarely solved. Hours before the latest possible graves were found, María Oliveras, the mother of Antonio Santana, one of the missing students, lit a candle and prayed at the campus where she and other relatives are holding a constant vigil. In his first two years in office, Mr. Peña Nieto has focused on revamping the economy and drawing foreign investors, earning praise from some economists who say he has set the stage for future growth. But critics argue that in the process, Mr. Peña Nieto has largely overlooked the lawlessness of towns like this one, 120 miles south of Mexico City, the evidence of which lies literally just under their surface. Members of the farmer brigades searching for the students — calling themselves “community police” who have stepped into the vacuum of authority in southern Mexico — said they were acting on a rash of tips from residents who do not trust any of the professional police. Leaning on a shovel, Miguel Ángel Jiménez, a leader of the community police, said he doubted the students could have been buried in this spot because the growth of weeds over it looked thicker than a few weeks would produce. It will take a couple of weeks for the authorities to test all of the new remains discovered in recent days. Prosecutors have confirmed that the corpses and remains in at least five mass graves uncovered so far are human, but they have not yet tied them to any of the students. On Friday, acting again on tips from residents, the farmer brigades searched a hilly trail, looking for caves in which residents believe bodies were left. Along the way, they found what appeared to be a safe house for a gang, littered with bottles, old clothes, candles and a portrait of Jesús Malverde, a gang icon. Later, a local guide working with them got a threatening telephone call as he headed down the trail from the cave. “Stop going up there,” the voice said over and over before hanging up, the man said. The school the students attended, the Escuela Normal Rural Raúl Isidro Burgos, is a teacher college with radical roots, steeped in revolutionary ferment and slogans. Now parents and other family members of the missing bide their time there, sipping coffee, chatting in clusters and sleeping on mattresses stuffed into classrooms and other spare space. The students had been organizing an Oct. 2 protest against cuts to their state-financed school, but they appear to have gotten into a skirmish with the police when they tried to steal buses to travel to and from the demonstration, human rights groups said. “Sometimes I can’t just sit and think,” said the mother of one student at the school, declining to give her name out of fear. She clutched a piece of paper with a prayer for “the Protection of the Precious Blood of Our Lord Jesus Christ” written on it. Eleucadio Ortega, another father, said his gut tightened with each report of a grave being found. In the days after his son, Mauricio Ortega, went missing, he searched parts of Iguala with other parents. But they found the effort futile and believe that only informants in the criminal world can provide real leads. He wonders if somehow the students got mistaken for any number of groups in conflict in the state, including a range of guerrilla groups and gangs. But, he said, his son was simply a peasant farmer who wanted to be a teacher to get ahead.